Numerous different types of injury are described as a consequence of windsurfing. The most recent survey of injury patterns in professional World Cup windsurfers found the second most common form of injury to be a head injury.1 The cause was usually one handed loops or “table-tops”, both spectacular forms of jump. Despite these findings, only 10% of windsurfers surveyed used a helmet. Less serious injuries such as abrasions are more common in amateur windsurfers. A similar mentality is seen however. 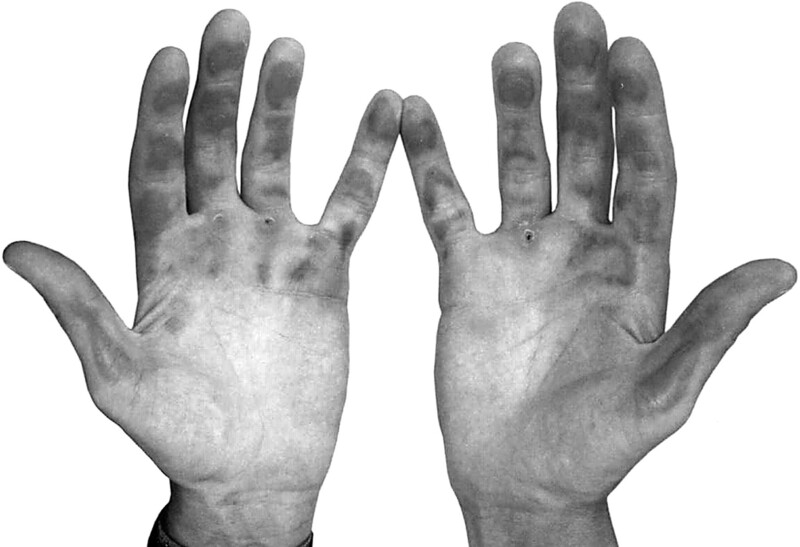 While windsurfing in the warm, salty waters of the Red Sea recently I was intrigued by quite how much discomfort I and fellow windsurfers were prepared to put up with from the effects of the activity on our hands (fig 1). About 10% wore gloves. Hands unaccustomed to windsurfing in warm, salty water: superficial abrasions from prolonged boom contact. Gosheger G, Jagersberg K, Linnenbecker S, et al. Injury patterns and prevention in World Cup windsurfing. Sportverletz Sportschaden 2001;25:50–4.